Slovak company ESET’s latest offering, the NOD32 Antivirus and Smart Security, comes with some new features and improvements. 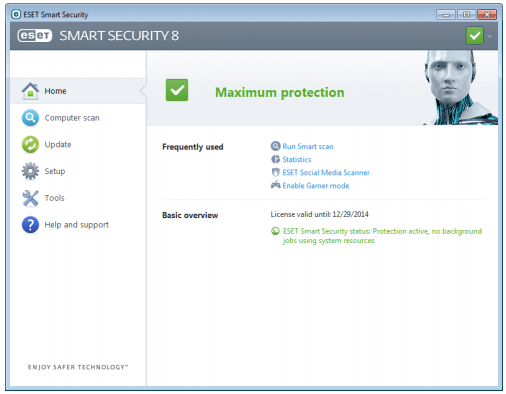 Here is a look at what’s new in ESET 2015, and the pros and cons. You will also find here all the details regarding its installation, Upgrade and renewal etc. Also find out the coupon codes to buy in cheaper price. Most independent labs give Antivirus 8 a high score for its malicious URL blocking capability and both ICSA and West Coast Labs have certified it for detection and removal of viruses. In zero day attack simulations, performance testing and malicious file detection tests run by AV-Comparatives, an Austrian test lab, the ESET Antivirus 8 scores the highest along with only Bitdefender and one other. The software offers a new free scan of Twitter and Facebook accounts for malicious or risky objects, which is great. This scan lets you track your scan history, choose where to post the results of the scan (it is possible to publicly post it on your social media account) and there is also a clever option to automatically send a direct message (DM) to anyone whose tweet contains a risky link. You can also see ratings of your privacy settings for Twitter and Facebook in the Security Center. For more than average users (in other words, the techie geeks) who know a thing or two about security, there are several bonus security tools included in the NOD32 Antivirus 8. The SysInspector tool surveys your system in great detail, including drivers, services, running processes etc. You can also create a bootable rescue disk, though the process needs an install of Windows ADK or AIK first. Antivirus 8 doesn’t do too well when it comes to blocking malware or phishing detection. Malware can install executable files despite the antivirus’s efforts, though it does manage to stop some installs and even rapidly delete files even before they execute. System scan takes an average of 26 minutes, even if you repeat a scan. It doesn’t ignore known safe files in repeat scans. The fact that the bonus tools are not of much use for the average user may also be a point to consider when buying this antivirus. ESET’s Smart Security 8 offers the same kind of antivirus protection as Antivirus 8, that is to say good risky URL blocking and social media scans. It blocks downloads from malicious URLs and in many cases, even blocks access to the link. In addition, there is a Network Connections tool offered on the suite which is meant for experts. This tool handles the assignation of network permissions to programs. ESET also has a very solid firewall, which successfully detects and blocks exploits even when your programs are all up to date and your system is not vulnerable. The newly added Parental Control tool also blocks access to websites that are inappropriate, based on forty six categories of websites. The filtering of content is independent of the browser you are using, which is a small convenience. The anti-spam filters out IMAP or POP3 accounts and can also integrate with Outlook Express, Windows Live Mail, Outlook and Windows Mail. An excellent feature on the suite is the ability to lock your computer from the cloud, should it be stolen or lost. When the lost computer next gets on to the Internet, it will be logged into a fake account and user files cannot be accessed. You may also be able to get a mug shot of the thief with the webcam that silently takes photos from time to time. You can also put your contact information on the desktop in case it falls into the hands of someone who will send it back to you. While URL blocking is excellent, anti-malware and anti-phishing detection is not so good on Smart Security 8. The Parental Control is useful, but unlike many other parental control systems, it cannot control the content viewed on Administrator accounts. The anti-spam accuracy has also fallen in comparison with the earlier version, and the program lets some spam into the Inbox while labeling a small percent of valid emails as spam. Both the NOD32 Antivirus 8 and Smart Security 8 have many new things to offer, though in some places they do worse than the earlier versions. The focus of Antivirus 8 is clearly on catching malicious activity rather than identifying risky files. If what you’re looking for is a risky URL blocker and not so much a static file detector, and have some tech knowledge, this may be an antivirus to consider. Smart Security 8 has a strong anti-theft protection, excellent malicious URL blocking, a strong firewall and parental control. It could have done better with anti-phishing and anti-malware, but it is a good suite to have for general protection. After downloading your ESET 2015 it is very easy to install it and activating your subscription. IF you are an existing subscriber and want to upgrade it to the latest version. It is same as like other antiviruses, that you have to remove your previous version from the computer and install the newer version. The same subscription key can be used to activate your existing plan. If your subscription near to expire or has been already expired then you can choose the renew option to get renew your subscription. You don’t have to install it again on your system. If you get some issue in installation. There is an official eset removal tool which can be used to uninstall the ESET products completely from you PC and Install a fresh copy of the product. Still if you have some issues then you should have to contact ESET Technical support team for the assistance. As like other vendors ESET also promote their products using their Coupon codes and promo codes etc. It can let you buy the ESET in cheaper and best price. Eset Coupon Codes are great way to save money. Black Friday and Cyber Monday Promo for ESET is on now. Check out. Check out at Discount Store. Thanks for the working promos.